Join us for networking and education for professionals supporting the perinatal population, including pregnancy, delivery and the first year of a child's life. This meeting is open to all professionals that work with expecting and new parents in Austin and the surrounding areas. Join us for networking and education for professionals supporting the perinatal population, including pregnancy, delivery and the first year of a child's life. 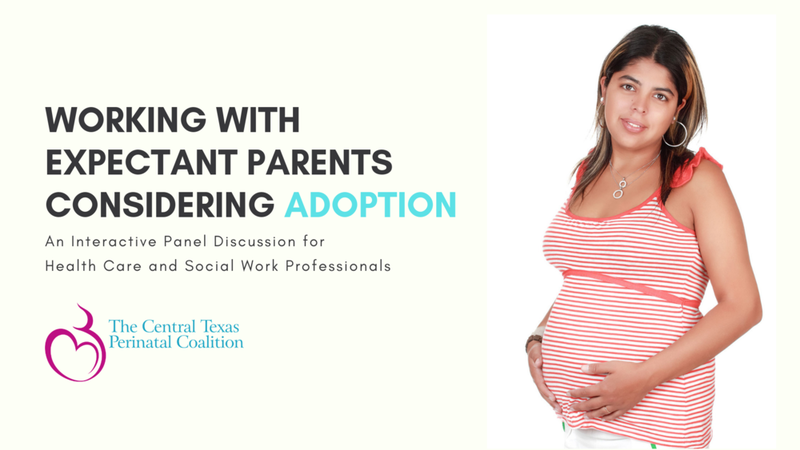 This meeting is open to all professionals that work with expecting and new parents in Austin, TX and the surrounding areas. We'll introduce the topic of milk banking for those not familiar, dive into the science of pasteurizing donated breastmilk to treat babies born too sick or too soon, and share stories of our generous donor moms and the babies who receive their milk. Kim Updegrove is a certified nurse midwife by trade with more than 500 deliveries under her belt. Since 2002 she's been supporting the Mothers' Milk Bank at Austin's mission to save premature babies and is currently serving as their Executive Director. Have you ever wondered how to best support your clients or patients making adoption plans? Come hear directly from birth parents who have placed a child or children for adoption about their experiences with healthcare professionals and social workers. They will help bridge the divide between professional and client as well as explain the incredibly emotionally complex territory that is working with the placing parent. Presenters will discuss cord blood banking and provide a general overview of stem cell science and current research. They will also present about the Newborn Possibilities Program which assists eligible families with free cord blood and cord tissue preservation for five years. As soon as babies come out of the womb, they are learning the complex intricacies of communication. From eye contact, social smiles, gestures, babbling, and spoken words, they are continuing to learn to communicate their wants, needs, and feelings in various ways. This presentation will focus on communication milestones in the first few years of life, how to promote your child’s social and verbal development, and what to do when there are concerns. Join us for networking and education for professionals supporting the perinatal population, including pregnancy, delivery and the first year of a child's life. This meeting is open to all professionals that work with expecting and new parents. Presenters will provide background information about perinatal risks faced by women with obesity, and the many barriers to success: cultural, mechanical, physiological, and emotional. Included will then offer tips and suggestions for how to help these women be more successful in their breastfeeding journey. This month's meeting will feature an education presentation from Giving Austin Labor Support (GALS). Overview of the WIC program including requirements and benefits that are available to women, infants and children. Sherry will share information about all the programs at Texas Parent-to-Parent but specifically the NICU network. Join us for networking and education for professionals supporting the perinatal population, including pregnancy, delivery and the first year of a child's life. This month's topic will be the Texas Family Connects Program and will be presented by Shalyn Bravens, Rachel Farley and Donna Sundstrom. Presentation on a new Evidence-Based Program model called Family Connects planned for Travis County. It is a voluntary, short-term nurse home visiting program offered to every family with newborn infants to maximize population reach and community acceptance. During this month's meeting, Brittney Roberts will be on hand to discuss the Austin chapter of Embrace Grace, a support group that connects single and pregnant mothers walking through an unplanned pregnancy. An overview of the Jeremiah Program model for transforming two generations from poverty to prosperity through five key pillars: affordable safe housing, career-track college education, supportive community, quality early childhood education, and empowerment and life skills. Please join us for a networking event in December in lieu of our educational meeting. Our Holiday Happy Hour, sponsored by Sage Therapeutics, will take place on Thursday, December 14 from 5:00-7:00 p.m. at Cenote. To attend, please RSVP by December 7 to rory@adoptionadvocates.net. Join us in October for more education and networking. Information on presenters coming soon! PLEASE NOTE: The August meeting has moved to Mothers' Milk Bank of Austin. Join us in July for our next meeting! We are excited to welcome Nicole Robinson and Tameshia Leaonard for this month's presentation. We are excited to have the following presenter's next week at our monthly meeting! Interested in speaking at an upcoming meeting? Submit a proposal today.